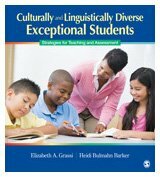 Elizabeth A. Grassi is Associate Professor of linguistically and culturally diverse education at Regis University. Prior to joining the Regis faculty, Elizabeth was a K-12 teacher and coordinator of ESL/language acquisition programs both in the United States and abroad. Heidi Bulmahn Barker is Associate Professor of elementary and special education at Regis University. Prior to joining the Regis faculty, Heidi worked in both special and general education teaching positions.